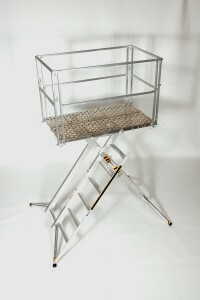 This model comes standard with our newest modular handrail. This handrail has 4 independent handrails that all lock together and lock to the deck. This allows you to remove any side that you choose. Our biggest and best model. Large enough to comfortably fit 4 to 6 guys on the deck. Height adjustable up to 7ft. Comes standard with a hinged leg. This platform is amazing. Not only does it have a 4,000 lbs capapcity it has a huge work area. It is height adjustable from 3 ft. to 7 ft. in one foot incraments. All our platforms are built to last. We build our platforms with only solid welds. This means that years from now your platform be just as strong as the day you bought it. Also the platform is made of aluminum so it will not rust. Your platform will be your new favorite tool for years to come. 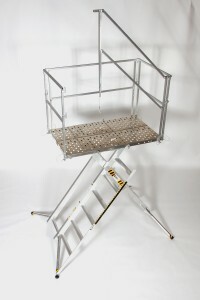 Does not have to be tagged and inspected like traditional scaffolding! Winner of a national SAFETY AWARD! Call for discounts. Discounts are given for home use, charities, small businesses, and multiple unit orders. Your TOP OF THE LINE X-DECK comes with FREE XCCESSORIES! Add any of the xcessories below to your order and they will be FREE! Xcessories will be discounted when we process your order.